Before epimediums became popular as garden plants, plants were known for their herbal use. 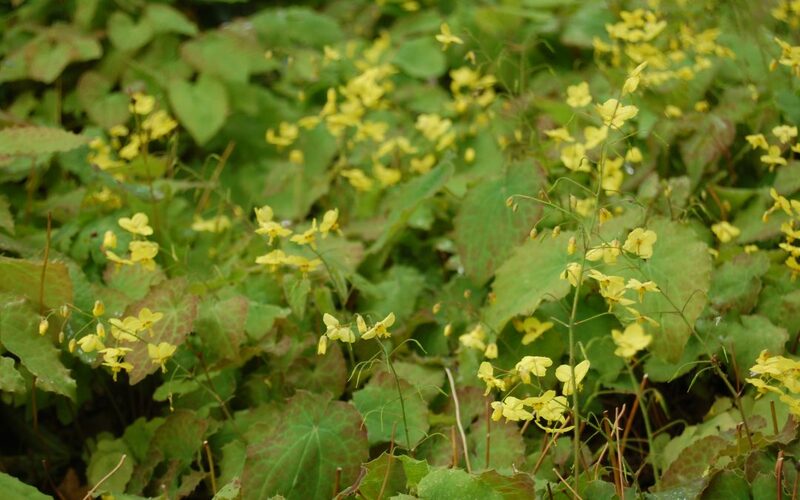 Roots of epimediums were thought to cause barrenness in women, thus the common name barrenwort. Bishop’s hat is also used as a common name, the flowers resembling the miter of the clergy. Epimediums are the best choice for dry shade. Tough, drought and shade tolerant, plants can thrive where tree roots are a problem. Most are rhizomatous, with the fast-spreading varieties preferred as ground covers : E. x rubrum – red-bloomed with white spurs, E. versicolor ‘Sulphureum’ – about a foot tall with yellow flowers, E. x warleyense ‘Orangekoenigin’ – orange-yellow blooming, and E. pubigerum- white flowered, with red-tinged sepals. Leathery, thick-textured foliage are the most appealing in spring, when flat, glossy leaves are blushed or edged burgundy, bronze, or red. Hooded or spurred flowers appear bird-like in flight. Lush mounds of E. x rubrum display a luminous quality not seen in other foliage perennials. Try to plant your Epimediums as soon as possible. These are adaptable and will have no problem acclimating to your growing area. Be sure to keep the soil moist to the touch if you do not transplant immediately. Protect from strong winds and drying out before planting. Where do I plant my Epimediums? Epimediums require good drainage and shelter from strong winds. Plants prefer evenly-moist, rich soils and part shade. Epimediums are tough in dry shade; fast-spreading species can cover bare spots in the shade garden. How do I plant my Epimediums? Dig a hole that is twice as wide and deep as the container the plant is in. Work this soil well and incorporate a balanced, slow-release fertilizer into the planting hole. Backfill the hole and set the plant even with ground level, firming the soil around it. Water in very well, making sure that the roots are in contact with the soil. While plants are getting established in the garden, water as needed. What should I do in order to have my Epimediums increase in beauty from year to year? Most epimediums bloom in early spring. Provide frost cover to protect new flowers and buds. When leaves start to unfold, small animals such as rabbits and insects might find the plants delectable. Where soil is alkaline, plants can get chlorotic, as epimediums prefer neutral to acidic soils. Apply mulch to protect plants from winter damage.